Stoke manager Tony Pulis has said Queens Park Rangers have enquired about Peter Crouch, but will only sell the striker if the deal is right for the club. QPR boss Harry Redknapp admitted his interest in Crouch, 31, on Tuesday. 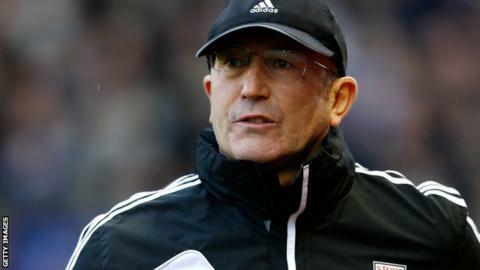 "I've spoken to Peter about it and it's up to him whether he wants to go," said Pulis. "It's got to be right for us, but we'll need someone to come in and do the same job." Crouch joined Stoke from Tottenham in August 2011 and has made 64 appearances for the Potters, scoring 19 goals. This season injuries have restricted Crouch to 15 starts from the 23 Premier League games so far. He has scored four goals. Should Redknapp convince Crouch to move to Loftus Road, it will be the third time he has signed the former England international, having previously bought him for Portsmouth and Tottenham. Crouch is not the only Stoke player to have been linked with a move away from the Britannia Stadium in recent days, with reports also suggesting Swansea are interested in forward Kenwyne Jones. Pulis himself plans to be active himself in the transfer market, admitting he has enquired about five players. But the former Gillingham manager would not give an indication on who he was interested in, adding that he did not like to discuss transfer business until deals were done. "I like to do business with other clubs and let press know afterwards," Pulis added. "I am disappointed things got out when you are dealing with other clubs, managers, agents etc. "When deals are done they have to be right for this club."